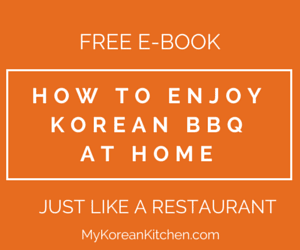 Learn how to make Korean sweet rice dessert (Yaksik)! Welcome back to My Korean Kitchen. As I implied in my last blog post, I want to kick off this year’s first recipe with Korean New Year’s Day food. 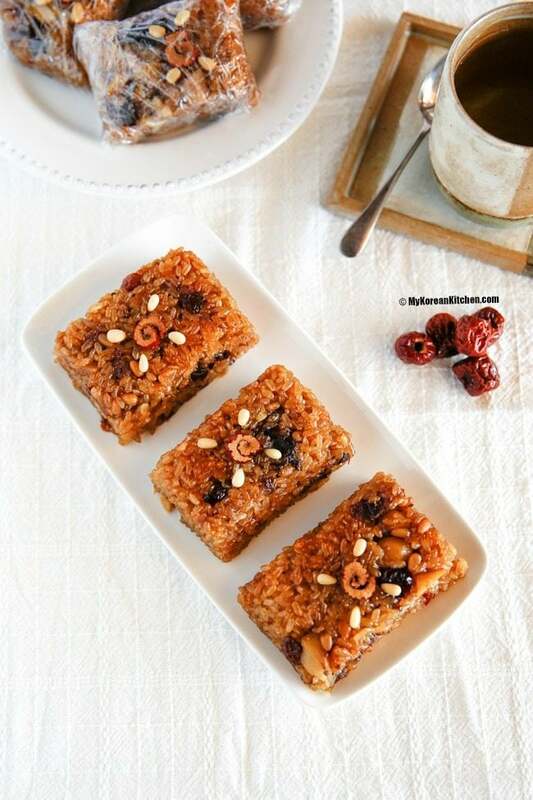 Today’s recipe is Korean sweet rice with dried fruit and nuts. Its Korean name is Yaksik/Yakshik (약식) or Yakbap (약밥). It means medicinal food. One of the key ingredients used is honey and honey was considered as a medicine in the old days in Korea. 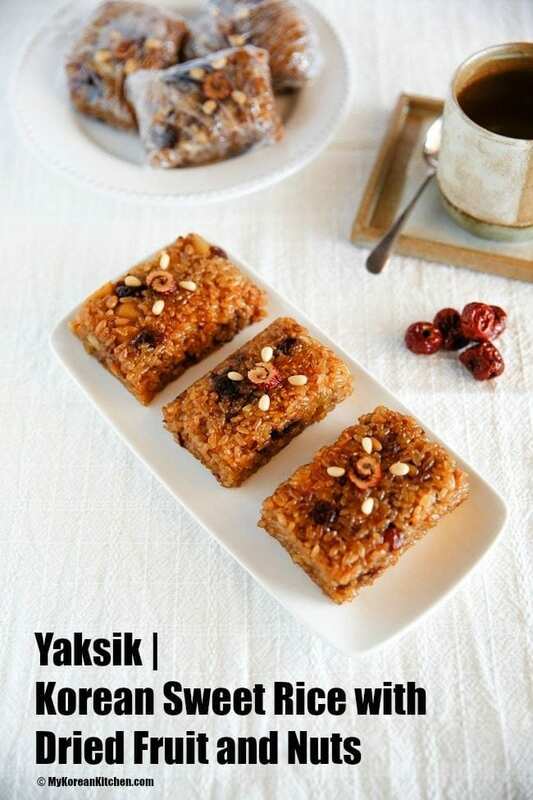 Anyway, Yaksik used to one of my favourite childhood Korean desserts! ? 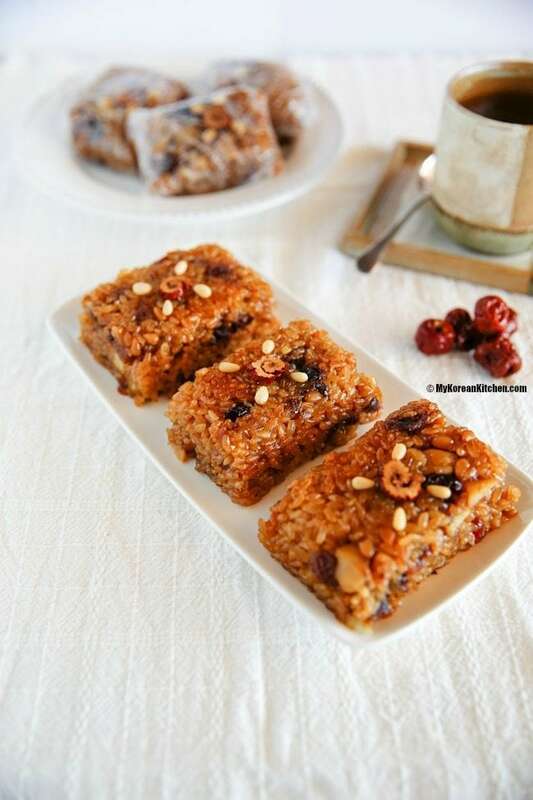 This is also perfect for on the go breakfast or snacks and even suitable for gift giving as well! Officially Yaksik is one of the foods you would eat on the first full moon of the new year (in the lunar calendar) – Jeongwol Daeboreum (정월대보름). 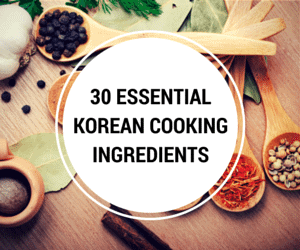 However, it is also typically served on other festive occasions such as Korean new year’s day (Seollal), Korean harvest festival (Chuseok), at a wedding receptions or at a 60th birthday party. 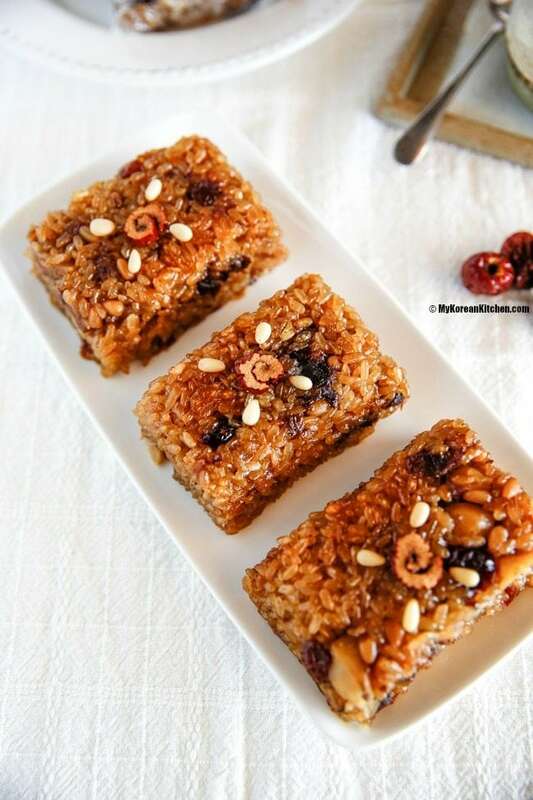 As you can gather from the descriptive name – sweet rice with dried fruit and nuts – the main ingredients are sweet rice (short grain glutinous rice), dried fruit (e.g. jujubes and raisins/sultanas) and nuts (e.g. chestnuts and pine nuts). 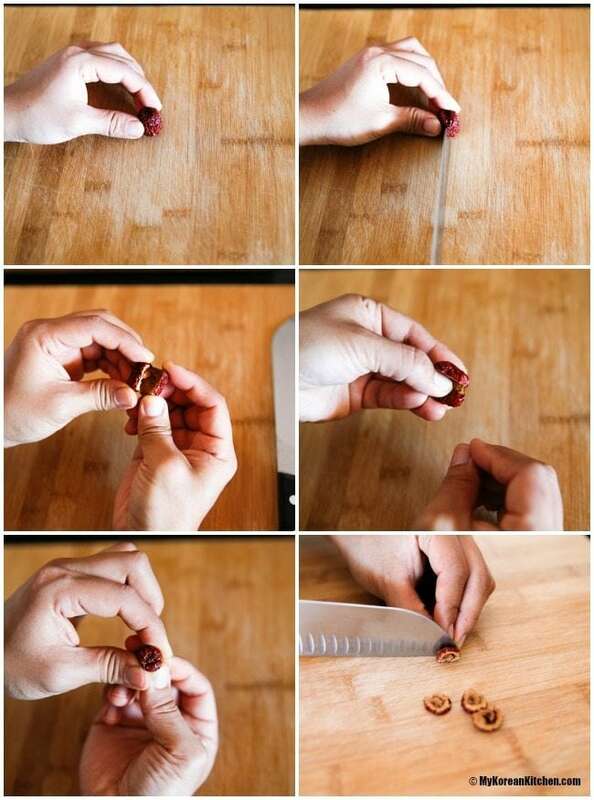 However other types of dried fruit and nuts (e.g. cranberries, walnuts, pecan, sunflower seeds etc.) can be used alternatively. 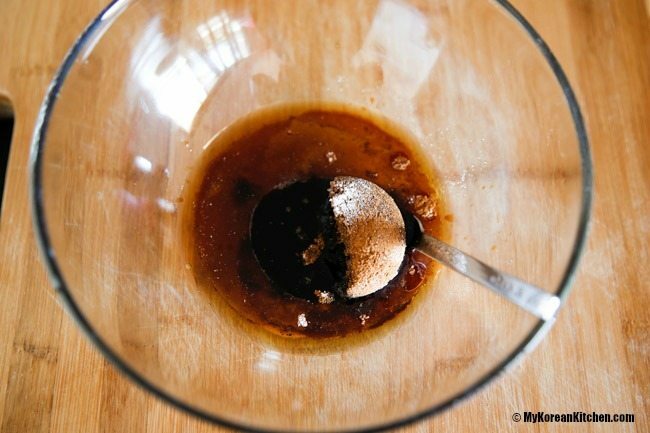 For sauce, honey and/or dark brown sugar, soy sauce, sesame oil and cinnamon powder is used. The texture is quite soft and sticky. The flavour is sweet, slightly salty (according to my friend but it didn’t stand out for me) and loaded with healthy dried fruit and nuts. The aroma from sesame oil adds a marvelous heavenly sensation as well. When I gave this Yaksik to my daughter for the first time the other day, she was all very excited because she thought she was getting a piece of western style cake. But once she bit a little bit, she made a really funny look – ‘what did you just give me? this is no cake! I was cheated!’. It was really funny watching her disappointed face. Immediately after that, she said she doesn’t like it so she gave it back to me. Then a few hours later, I was enjoying Yaksik for my afternoon tea and my daughter asked what I was having? I told her it’s Yaksik. Then she told me she wants to try some. I reminded her that she didn’t like it earlier but I still offered some. She bit it and she shouted aloud, “I love it!” And since then she loves eating Yaksik. Anyway, I hope you enjoy this sweet treat! P.S. 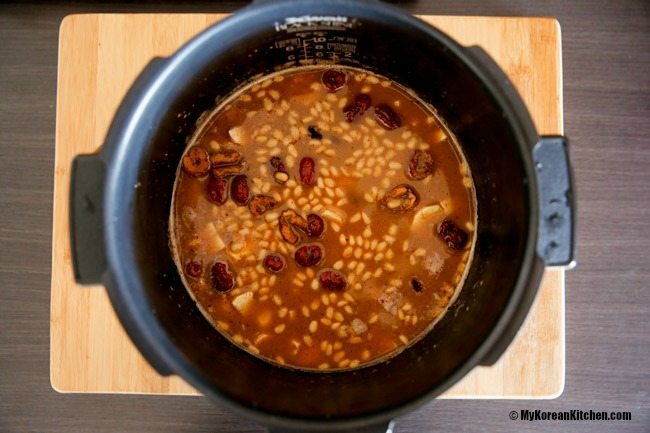 I used my Cuckoo rice cooker for the recipe below. Alternatively, you can use other programmable pressure cookers such as an instant pot or even a stove top based pressure cooker. 1 cup* = 180 ml (using rice measuring cup). This is equivalent to 3/4 standard measuring cup. 1. 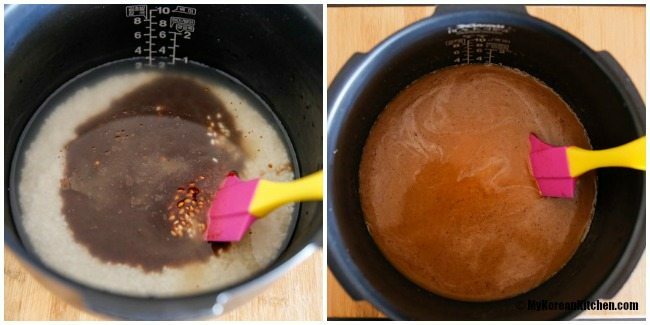 Put the sweet rice into the rice cooker pot and rinse it with cold running water a couple of times (until the water is clear). Drain the water. 2. Add the cooking water and the seasoning sauce into the rice cooker pot and mix them well. 3. Add the nuts and fruit on top. Make sure these are evenly spread in the pot. 4. Set the “multi steam” function for 35 mins and cook. 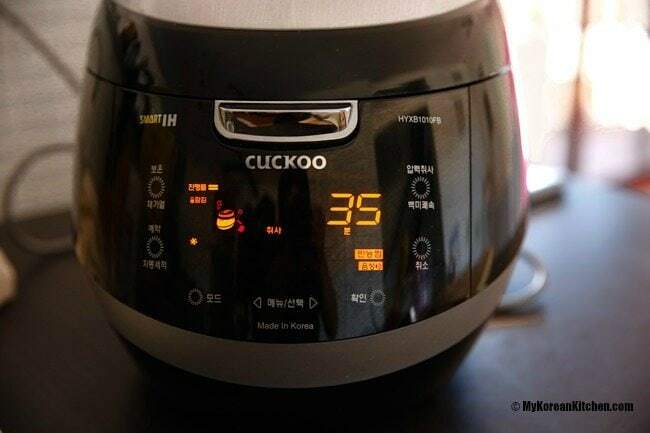 – This is based on my cuckoo rice cooker setting. 5. 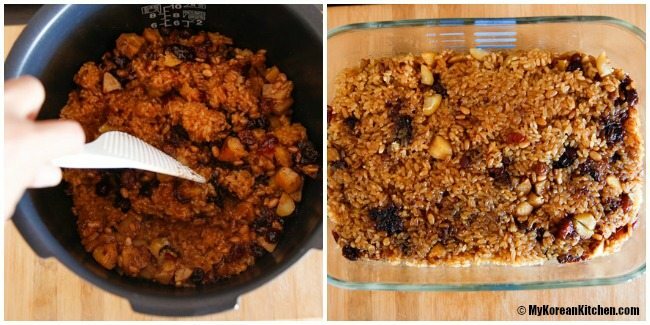 Once it’s all cooked, gently stir and mix around the rice, dried fruit and nuts with a rice scoop. Put them into a medium sized square or rectangle mould. (I just used a pyrex container. You can also use a baking mould.) Cool down for 20 to 30 mins in the mould. 7. Slice the Yaksik into your preferred size. 8. Serve. For Yaksik that are not for immediate consumption, wrap them individually with food wrap, store them in a container and keep it in the fridge (for a few days) or freezer (up to a few months). Yaksik shape can be round or square. It doesn’t have to be rectangular. You can even use any shapes of cookie cutter (e.g. heart) to make your favourite shaped Yaksik. In this occasion, the decoration will have to be done after the cutting. While Yaksik can be consumed cold (straight from the fridge), it tastes better if it was left out at room temperature for 20 to 30 mins to soften a bit. If it was kept in the freezer, take them out and thaw for 3 to 4 hours at room temperature. (They can be left out overnight for breakfast the next day.) It is microwavable (about 2 mins if it was frozen). If you want softer and stickier textured Yaksik and/or if you’re going to store it for more than 2 days, I recommend soaking the rice for 1 hr before cooking (after step 1). 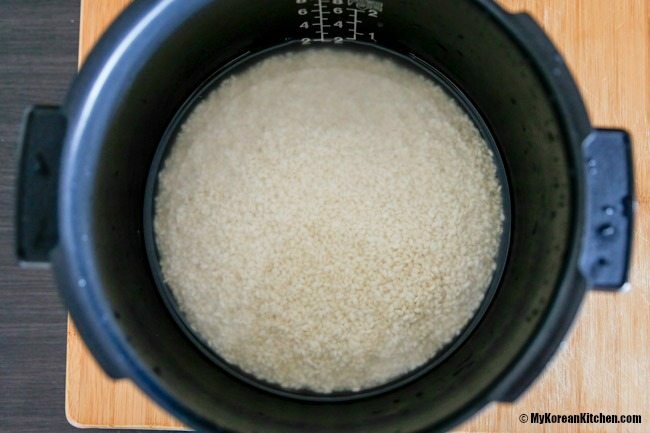 Put the sweet rice into the rice cooker pot and rinse it with cold running water a couple of times (until the water is clear). Drain the water. Add the cooking water and the seasoning sauce into the rice cooker pot and mix them well. Add the nuts and fruit on top. Make sure these are evenly spread in the pot. Set the “multi steam” function for 35 mins and cook. - This is based on my cuckoo rice cooker setting. 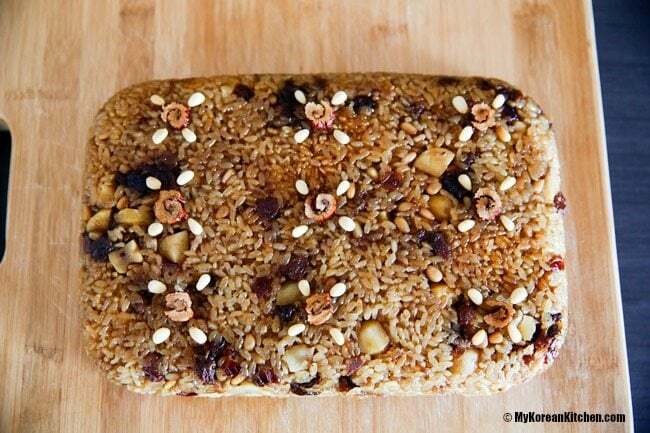 Once it’s all cooked, gently stir and mix around the rice, dried fruit and nuts with a rice scoop. Put them into a medium sized square or rectangle mould. (I just used a pyrex container. 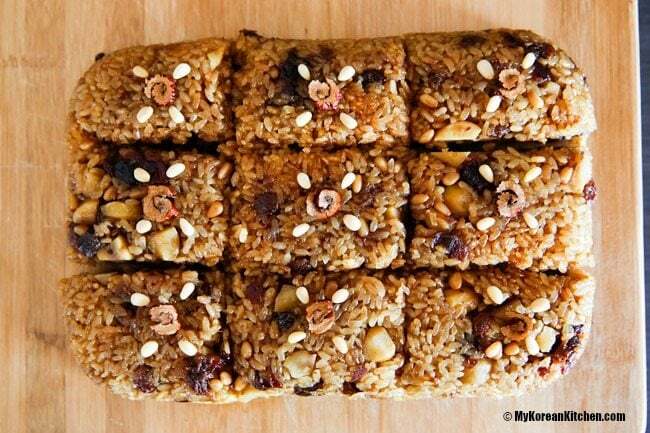 You can also use a baking mould.) Cool down for 20 to 30 mins in the mould. Slice the Yaksik into your preferred size. Serve. For Yaksik that are not for immediate consumption, wrap them individually with food wrap, store them in a container and keep it in the fridge (for a few days) or freezer (up to a few months). Hello. 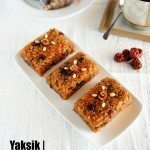 Thank you for posting this recipe for yakshik! I have an Instant Pot. What setting do I use and how many minutes should I set it for? How should the pressure be released? Hi Judy, Unfortunately, I’m not familiar with an instant pot. Unless someone else can chime in their experience, you will have to go with trial & error method. In Korea, sweet rice is called “chapssal”, which literally means “sticky rice” since it becomes soft and sticky when cooked. It is good for those with digestive problems since it is not irritating to your stomach lining and it is easy to digest. Where did the recipe go? Ive been so looking forward to making this and now that I have the time, all that will load is comments. I hope this gets resolved soon and they looked wonderful. Thank you so much for the fix! I am going to print the recipe out as a just in case, then heading to the kitchen! At the moment, my recipes within the contents (in the middle of the post) are fine. But if you get the recipe from the recipe card (at the end of the post), then they won’t be accurate. Thank you for your concern! I ended up copying and pasting the recipe onto word pad. (had to make a few adjustments in word pad after pasting) not a big deal. Saved it to my desktop and then printed it from there. Sadly I have to wait until next weekend to make them, but make them I will! Will be a nice treat for the weekend. Sorry about the trouble you had to go through. I just fixed this recipe for printing (if you need it again!). Hope you enjoy my Yaksik recipe! I just happened to visit your blog for the first time and love it! Yasik is my favorite and would like to make this soon. My korean rice cooker has: Mixed, narungi, porridge setting. Would any of these settings work? Thank you for posting awesome recipes! I just made this tonight and it tastes pretty good. The only concern I have is that there was a thick layer of burnt rice on the bottom of my pot that took awhile to get cleaned. Any suggestions for this? Or is this supposed to happen? Hello, Good to hear that you enjoyed Yaksik! As for your burnt pot, which rice cooker did you use? Because, that’s not normal. 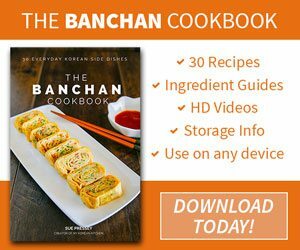 This looks absolutely lovely, I really want to try it, but I don’t have a rice cooker or a pressure cooker. Could I make this by soaking the rice as you do when normally preparing sticky rice and then cook it in a pot, covered and with at the ingredients as it shows in the steps here? You will have to use a steamer, not just a normal pot. After soaking the sticky rice for a few hours, steam it initially until partially soften. Then take the rice out, mix with the rest of ingredients then put them back into the steamer. Cook further until they are fully cooked. It’s a long process! Good luck! 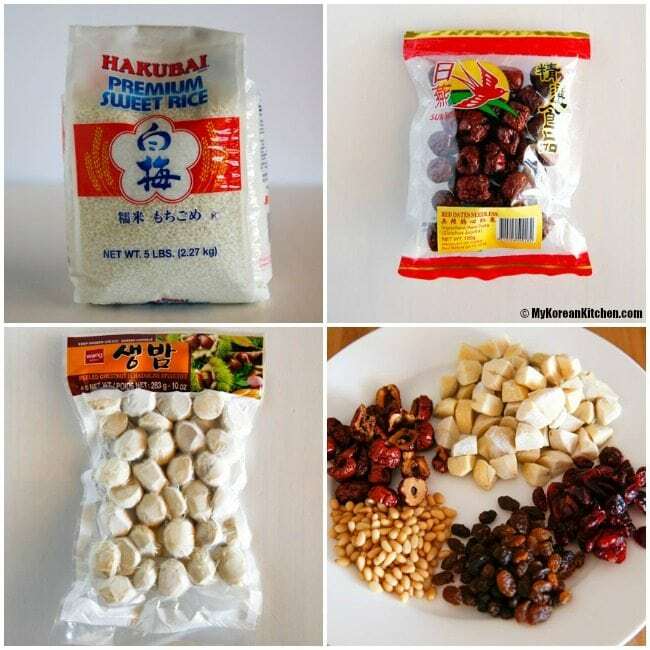 I found only dried jujubes; is it possible to use those for this recipe? I used dried jujubes in this recipe. Though it was already fitted. Just remove the seeds if not done already. Nice one Sue. We shall give it a try! I am also curious about the rice cooking method used here. What consistency are we looking for the rice to be? I remember snacks like these from when I lived in Seoul, but since I usually only cook for myself, I don’t feel as if the Cuckoo would be a worthwhile investment. And I don’t really have a regular use for a pressure cooker. If you follow my recipe exactly, you can feel the rice texture a bit. I think this texture would be similar to the one made by traditional method. If you want more softer and stickier texture (you won’t notice the rice grain texture much) then soak the rice in some water before start cooking it. The time will vary depending on the cooking method. e.g. for pressure cooking 1 hr is enough. for traditional method about 5 hrs. That is some fantastic rice cooker I must say. This looks delicious. Certainly the amazing photograph helps. And of course anything with cinnamon is bound to be good. This looks delicious! I’m heading to the Korean market now to get supplies. One question though. I’m living in the stone ages and don’t have a rice cooker (?!!?). Can this be prepared by cooking on the stove? Thanks for all your great recipes. My family loves trying them out! If you don’t have a pressure cooker, then you will have to make it traditional way using a steamer. This one takes 7 hrs + as you will have to soak the sweet rice for about 5 hrs and cook everything for 2 hours. I will update my recipe to accommodate this traditional method later.